If your motto is, “Have drone, will fly over wildfires,” you could find yourself in some hot water. Earlier this month, we reported how private drones were delaying firefighting efforts in California’s San Bernardino County. Now, the heads of those drone pilots could be on the proverbial chopping block. Obviously, people weren’t happy. Officials, who credit the drones with grounding firefighting aircraft and allowing the fires to spread, are offering a $75,000 reward for information leading to the pilots of the drones. But, it doesn’t stop there. Bills have been introduced into California and U.S. legislature that would make it illegal to fly personal drones over wildfires. In California, the proposed penalty is a misdemeanor charge with up to $2,000 in fines. Not to be outdone, the U.S. House of Representatives is looking at a bill that would make it a federal offense with up to five years in prison. 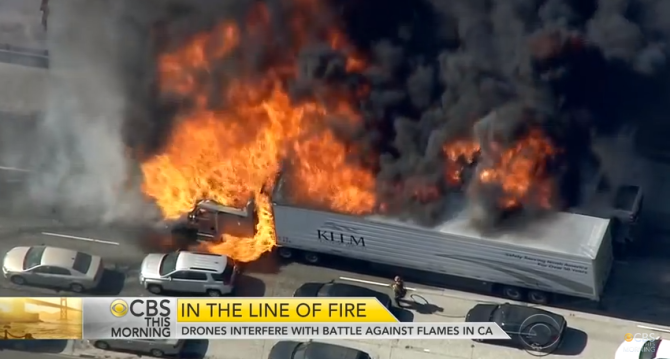 There are times when private drones have actually been an asset to firefighting efforts. Keith Muratori, a firefighter from Bridgeport, CT has been using his drone to help local departments get a real-time assessment of the blazes they are battling. In this particular instance, the Fairfield Fire Department was thankful for the footage Keith was able to stream to their crews on the ground, giving them an accurate picture of where to best direct their efforts and resources. Drones pose an incredible potential to be either an asset or a hindrance to emergency operations. If you’re uncertain which category your flight may fall into, I’d suggest you just keep your bird on the ground and pass the marshmallows. I think the $75K reward is probably being used as an attention getting scare tactic. There won’t likely be a problem with the next fire.